Epsilon Aurigae has a two-year-long eclipse that occurs every 27 years. The current eclipse started in August 2009 and amateur and professional astronomers have taken this opportunity to train as many telescopes on the event as possible. Monnier led the development of the Michigan Infra-Red Combiner (MIRC) instrument, which uses interferometry to combine the light entering four telescopes at the CHARA array at Georgia State University and amplify it so that it seems to be coming through a device 100 times larger than the Hubble Space Telescope. MIRC allowed astronomers to “see” the eclipsing object for the first time. The object that eclipses the primary star is dark — almost invisible — and is only seen as it passes in front of Epsilon Aurigae, the fifth brightest star in the northern constellation Auriga. 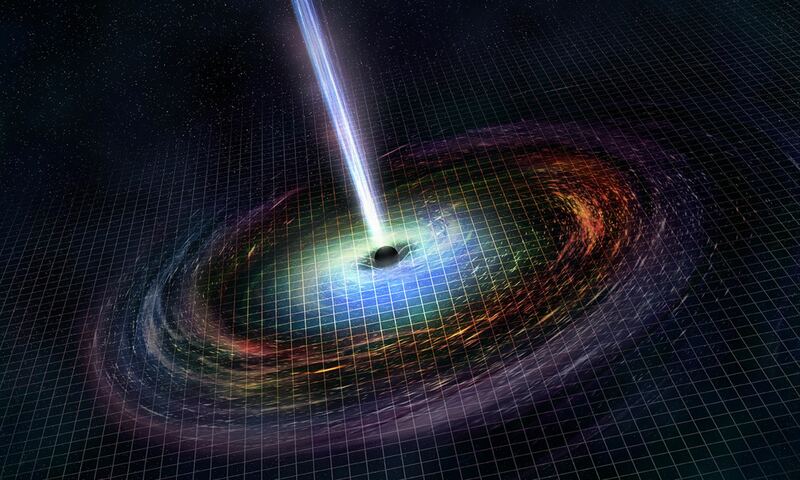 Because astronomers hadn’t observed much light from it, one theory is the object was a stellar mass black hole. But the prevailing theory labeled it a smaller star orbited edge-on by a thick disk of dust. The theory held that the disk’s orbit must be in precisely the same plane as the dark object’s orbit around the brighter star, and all of this had to be occurring in the same plane as Earth’s vantage point. As unlikely as this alignment would be, it explained the observations. The new images show that this is indeed the case. A geometrically thin, dark, dense, but partially translucent cloud can be seen passing in front of Epsilon Aurigae. “This really shows that the basic paradigm was right, despite the slim probability,” Monnier said, and the disk appears much flatter than recent modeling from the Spitzer Space Telescope suggests. “It’s really flat as a pancake,” he said. While the “movie” of the disk passing in front of the star looks eerily like Saturn’s rings, Monnier doesn’t think the object is like a ring system. MIRC has also allowed astronomers to see the shape and surface characteristics of stars for the first time. Previously, stars were mere points of light even with the largest telescopes. The new findings will be published in the April 8 edition of Nature. Researchers from the University of Denver and Georgia State University also contributed to the research. At the first paragraph, in the third line, there’s a missing “s” in the possessive form of the pronoun “it”. Oh, IVAN3MAN, what would I do without you??? An incredible achievement, and what a fascinating system! Great to see the CHARA array putting out this sort of work – high angular resolution imaging has so much promise but has been slow in finding it’s feet. Both the CHARA array over in the states and the SUSI array in Australia (sister instruments in a way) will yield many more interesting discoveries in the coming years in high angular res astronomy me thinks. I believe it’s time for you to grab your coat and see yourself out. What a fascinating article, thanks Nancy! Incredible to be getting these types of images. A truly remarkable result for interferometry given Earth’s high atmospheric opacity to ground based IR telescopes, which AFAIR was a selling point for Spitzer, SOFIA and JWST. It will fascinating to watch as the center of the disk emerges over the next twelve months and if the eclipsing object lights up as it passes behind Epsilon Aurigae thirteen years from now. The disk must be large, but how large? And how massive? How far is the companion from Epsilon Aurigae? That is certainly weird. Maybe a disc of dust in orbit around the star? Actually, this is just awesome. Just imaging the star’s disk is an amazing feat in itself, but this is marvelous. Really creepy too! I don’t understand why you choose the one grammatical error in an article which has many errors. It doesn’t affect the content any more than those you didn’t say anything about. Wow, I love the “what the hell is this” feeling looking at that movie. Not that this would be a simple answer but I keep thinking ringworld looking at this. Aodhhan, that’s not a grammatical error, but a typographical/orthographical error. Perhaps you shouldn’t correct others when you don’t know what you are talking about, generally-speaking. I’ve mentioned this before: it’s generally easy to proofread someone else’s work, but difficult to proofread one’s own work, which is why I usually put aside an essay or letter that I’ve written until the next day to check it over, and I always manage to spot grammatical and/or typographical/orthographical errors that I had missed the night before; it’s the change of perspective that does it! Next PostNext Is Our Universe Inside Another Larger Universe?